This president dwarfed by – Jimmy Carter! There is much that we like about libertarianism, but have points of strong disagreement with most of the libertarians we listen to and read. The one we find ourselves most often in agreement with is John Stossel. Had today’s politicians and opinion-makers been in power four centuries ago, Americans might celebrate “Starvation Day” this week, not Thanksgiving. That wasn’t the only thing about the Plymouth Colony that sounds like it was from Karl Marx: Its labor was to be organized according to the different capabilities of the settlers. People would produce according to their abilities and consume according to their needs. That sure sounds fair. If people can access the same stuff by working less, they will. Plymouth settlers faked illness instead of working the common property. The harvest was meager, and for two years, there was famine. But then, after the colony’s governor, William Bradford, wrote that they should “set corn every man for his own particular,” they dropped the commons idea. He assigned to every family a parcel of land to treat as its own. The results were dramatic. Much more corn was planted. Instead of famine, there was plenty. Thanks to private property, they got food — and thanks to it, we have food today. The Pilgrims weren’t the first settlers on the East Coast of the New World to make this mistake. The lesson that a commons is often undesirable is all around us. What image comes to mind if I write “public toilet”? Consider traffic congestion and poor upkeep of many publicly owned roads. But most people don’t understand that the solution is private property. When natural resources, such as fish and trees, dwindle, the first impulse is to say, “Stop capitalism. Make those things public property.” But they already are public — that’s the problem. No one starves when ranchers are allowed to own land and cattle. Or turkeys. Private ownership does good things. No peaceful nuclear program, complete with Obama-backed enrichment, can be complete without ballistic missiles. A nuclear energy program without ballistic missiles is like a house without a giant cannon mounted on top or a shopping bag that isn’t wrapped in razor blades. Now we all know that Iran’s nuclear program is entirely peaceful. There are perfectly good reasons why the 4th largest oil producer in the world and the 2nd largest oil producer in the Middle East would need a nuclear energy program. It’s the same reason Eskimos keep buying artificial ice. Because they just don’t have enough of the real thing. And nothing is as peaceful as ballistic missiles. What could Iran possibly want with ballistic missiles? Maybe they want to conduct diplomacy by firing peace notes and doves in ballistic missiles at their new friends. President Hassan Rouhani and Foreign Minister Javad Zarif presented this awesome achievement Monday to their hard-line critics at home, who accused them of giving away too much in terms of Iran’s nuclear program for the sake of a deal with the West. Most immediately, a hostile Iran with a role in the ongoing US-sponsored negotiations with the Palestinians does not bear thinking of. Israel and Saudi Arabia both find Iran’s promotion to world status more shocking and deleterious even than its pretensions to a nuclear weapon. Neither had imagined the Obama administration capable of an about face so extreme. The about face is not conjecture – it has happened. It has happened because it seems unthinkable to most people that Obama would destroy the West if he could. However naive, incompetent, ignorant, deceitful he is, the very fact that no one would believe that that is what he is hoping to do, has made it possible for him to take such steps as this giant one in Geneva. Iran is obviously more likely to advance Islamic world-power than Saudi Arabia or the Muslim Brotherhood. So with Iran he has negotiated the great betrayal. 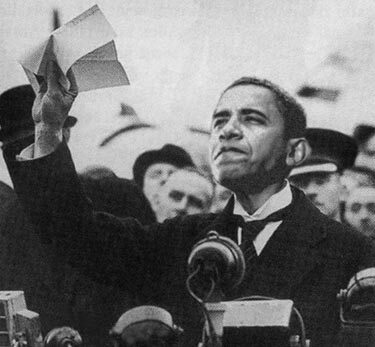 As a result of the patient efforts of Barack Obama, Valerie Jarrett, and John Kerry, Iran can now build nuclear bombs. When it has them it is more than likely to use them. Then, assuming that countries attacked by Iran’s nuclear weapons will retaliate with theirs, nuclear war will have started and this is what will happen to vast numbers of people and the earth we inhabit. Our information source may be found here. It is a site dedicated to general nuclear disarmament, which is not a goal we argue for. But we are reasonably confident that the facts they provide are reliable. Because of the tremendous amount of energy released in a nuclear detonation, temperatures of tens of millions of degrees C develop in the immediate area of a nuclear detonation (contrast this with the few thousand degrees of a conventional explosion). … At these temperatures, everything near ground-zero vaporizes (from a few hundred meters in 15 kiloton weapons to more than a kilometer in multimegaton weapons). The remaining gases of the weapon, surrounding air and other material form a fireball. It is the cumulative effects of these firestorms – the creation of a stratospheric smoke layer resulting in deadly global climate change – which ultimately become the primary environmental consequence of nuclear war which threatens [the continuation of] human existence. EMP from high-yield nuclear detonations will subject electrical grids to voltage surges far exceeding those caused by lightning. Modern VLSI chips and microprocessors, present in most communication equipment, TVs, radios, computers and other electronic equipment are extremely sensitive to these surges and immediately get burnt out. Thus all possible communication links to the outside world are cut off. War planners consider the EMP from the detonation of a high-yield warhead as capable of disrupting the entire communication system of their nation, and in this way a single missile launch could begin a nuclear war. Massive absorption of warming sunlight by a global smoke layer would cause Ice Age temperatures on Earth. NASA computer models predict 40% of the smoke would stay in the stratosphere for 10 years. There the smoke would also destroy much of the protective ozone layer and allow dangerous amounts of UV [ultra-violet] light to reach the Earth’s surface. Half of 1% of the explosive power of the deployed nuclear arsenal can create nuclear darkness. 100 Hiroshima-size weapons exploded in the large cities of India and Pakistan would put 5 million tons of smoke in the stratosphere and drop average global temperatures to Little Ice Age levels. … A large nuclear war could put 150 million tons of smoke in the stratosphere and make global temperatures colder than they were 18,000 years ago during the coldest part of the last Ice Age. Killing frosts would occur every day for 1-3 years in the large agricultural regions of the Northern Hemisphere. Average global precipitation would be reduced by 45%. … Growing seasons would be eliminated. A large nuclear war would … cause most [survivors] to starve to death. … Deadly climate change, radioactive fallout and toxic pollution would cause a mass extinction event, eliminating humans and most complex forms of life on Earth. Connoisseurs of irony may like to remember that Obama was awarded a Nobel Peace Prize – and that he has been steadily reducing America’s military capabilities while working to allow a huge increase of Iran’s, a self-declared and proven enemy of the United States. A stupid and disastrous agreement has been reached between the Great Powers and Iran, led by Secretary of State John Kerry. Sanctions were working. They forced Iran to negotiate. Now the sanctions will be eased, and Iran will continue to enrich uranium, and build a reactor to make plutonium bombs. We hope Israel will at last take military action to destroy the Iranian nuclear capacity. John Bolton, the excellent former US ambassador to the UN, calls the agreement “abject surrender”. Moreover, the international climate of opinion against a strike will only harden during the next six months. Capitalizing on the deal, Iran’s best strategy is to accelerate the apparent pace of rapprochement with the all-too-eager West. The further and faster Iran can move, still making only superficial, easily reversible concessions in exchange for dismantling the sanctions regime, the greater the international pressure against Israel using military force. Iran will not suddenly, Ahmadinejad-style, openly defy Washington or Jerusalem and trumpet cheating and violations. Instead, Tehran will go to extraordinary lengths to conceal its activities, working for example in new or unknown facilities and with North Korea, or shaving its compliance around the edges. The more time that passes, the harder it will be for Israel to deliver a blow that substantially retards the Iranian program. By which he means Congress. Is there any choice for Israel now but military action? Milton Friedman explains how the formula would destroy a society. And here he talks – inter alia – about the importance of limiting government power to preserve the freedom of the individual.